Change is in the air over at Twitter. Last week, the social media giant’s CEO stepped down, and earlier this week, we heard reports of the company’s forthcoming “Project Lightning,” a Snapchat-esque feature that’ll make it easier for you to keep up with trending events. Twitter’s latest upstart idea? Shopping. As announced yesterday in a blog post, the social media company is test driving two new features to encourage its users to spend more on Twitter. First, we’re going to start seeing dedicated product pages, featuring images, videos, product descriptions, pricing information, and e-commerce integration. You’ll also be able to look at a selection of “top tweets” surrounded a product—something of a Twitter-flavored reviews section. 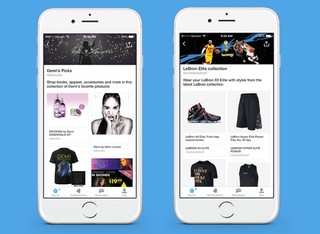 These product pages can be aggregated into “collections”, which are associated with a company’s main Twitter handle and can be accessed via a new “Browse Collection” button on a profile page. (Featured collections announced yesterday include Beats by Dre, Target Swimwear, and Game of Thrones). It’s too early to say whether Twitter—a service that many of us use on the go to get a cursory sense of the news or learn what our friends ate for breakfast—can corral its 140 character microbloggers into the more attention-demanding activity of buying stuff. Then again, this is all part of a broader strategy to monetize the company’s massive user base, and if that’s something Twitter can do without shoving more ads in our faces, they have my blessing.